Kamakura is town around 1.5 hour south of Tokyo. It’s packed of culture and tradition and more temples you can visit in your lifetime. 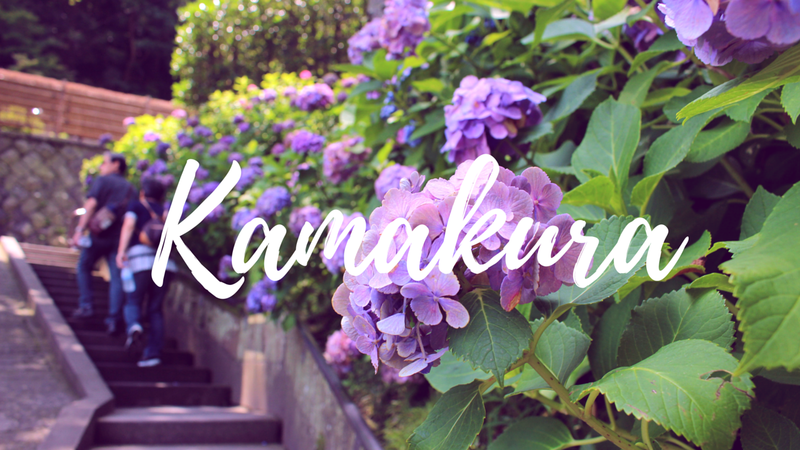 During summertime, Kamakura is also famous for its thousands of blooming Hydrangea flowers. I took a day trip to Kamakura and got to visit many temples. From Shinjuku station, I took the Odakyu Express all the way till the last stop – Fujisawa which took about an hour. Then I transferred to the famous Enoshima Electric Railway. This railway appeared in some famous movies as well as manga/anime series. It runs along the coast and then to Enoshima Island. The Japanese call it Eno-Den (Short for Enoshima Dentetsu 江ノ島電鉄). The train ran slowly through neighborhoods and around half an hour later I got off at Gokurakuji Station and visited the first temple. Jojuin is a Buddhist temple built by a high rank monk back in the 1700s. Here you can get the typical Omamori (Good luck charm) for relationship, school, general luck, child birth, transportation safety, but you can also get the charm in your birth year in the 12 revolving years in traditional Chinese culture. Hydrangea flowers usually bloom during June 1st – June 30th each year. I was just a day too late so they were already taking down the garden. I continued down the road towards Hase Station for Hase Temple (Hasedera 長谷寺). The road was really nice a quiet, with many tree above your head. Along the side of the road was a mossy green wall. All of these towns along the Enoshima Railway were very quiet and lovely. There were a lot of small family owned shops selling anything from souvenirs, to coffee, to gardening tools. As you walk through these towns you can also smell the ocean breeze since it’s just meters away! Hasedera is a very large Buddhist Temple very famous for its Hydrangea flowers in summer. During spring there’s also Cheery Blossoms, and in autumn the Japanese Maple blooms throughout the temple grounds. It also has one of the biggest wooden statues in Japan, towering at 9.18m. They worship the Goddess of Mercy “Kannon”. She is also very common in Buddhist temples in Chinese cultures. The temple also has an outdoor deck high up, overlooking the whole Sagami Bay area with a stunning view. Behind that is a small bamboo garden and then a stairway up to their Hydrangea garden. Flowers bloom throughout June & July and attracts thousands of visitors. I would say that Hase-dera is a must-visit if you are ever in the Kamakura area. It’s July in Japan, and the temperatures were soaring hot around 35C at noon. I was already sweating after walking all around Hase-dera. Luckily next stop is Kamakura station, so I enjoyed the air conditioning for around 3 stops on the Enoshima Electric train again. There were 4 temples I wanted to visit in the Kamakura station area, the main temple is Tsurugaoka Hachimangu, and then there’s Myohoji (famous for its green mossy steps), Sugimoto Temple, and Hokokuji Temple (famous for bamboo gardens). Everything was scattered around. Myohoji was a 15 minute walk to the South East of the station. Hachimangu was just 10 minutes North of the station, and both Hokokuji and Sugimoto Temple were a good 30 minute walk North East of the station. I was really running low on energy, and at this point I haven’t had any food since a Starbucks wrap before my night flight the prior day, I somehow made it to Myohoji first and then stopped at Hachimangu. I had to skip the other two. Myohoji is a small Buddhist temple built around the 13th century. It’s a humble temple that blends into the nature surrounding it. Instead of clearing the ground and planting the buildings, they let the nature around it grow naturally. There was a little garden of some Hydrangea flowers, after walking through you see a wooden gate. Behind it are some stairs up into the forest. You then hit a point where you can no longer go straight and that’s where you see its famous mossy stairs. To be honest I only found out from searching on Pinterest, “Temples in Kamakura”. To the right there were a set of some smaller stairs up deeper into the woods which eventually lead to a small monument where the founder’s hut used to be. It was a nice little temple but I love how it is so different from all of the other temples you see. I love how it is so deep within nature. The whole atmosphere is just very relaxing. Tsurugaoka Hachimangu is the most important Shinto Shrine to the city of Kamakura. It has the classical red and white colored architecture for its buildings. To me, that is what represents Japanese shrines. To get to Hachimangu, you walk a 1.8km wide street. Along the way there are traditional small stores selling souvenirs, anything from yukata to lucky charms/cats, or fans, handkerchiefs, paper umbrellas and fans. Most of the important festivals are held at this Shrine, and at the time I was there it was Tanabata (more on Tanabata later). The grounds of Hachimangu is actually huge. I didn’t get to explore all of it. If you just go straight ahead upon entering, you will get to the main building. There is also an Inari Shrine and road to Inari shrine within Hachimangu, similar to the one in Kyoto (Fushimi Inari) Here I got my first Gu (凶) unlucky Omikuji, so I had to tie it on one of the bars on the side. There were priests ringing bells on top of people’s heads to pray for them as part of the Tanabata festival. In Japan, people write their wishes on pieces of paper and hang it on bamboo wish trees to celebrate. They hang up decoration that kind of look like jellyfish, with a round head on top and strips flowing in the air on the bottom. It comes in all colors and Hachimangu was full of them! In Chinese culture this is the festival of lovers. Once a year, 2 lovers (stars Vega and Altair) who are separated by the Milky Way get to meet up on this day. Some shrines are more famous for certain lucks than others, and I’m not sure if Hachimangu is famous for praying for love, but I got one of their charms for relationship ( 縁結び お守り). *One of the most famous shrines for Love is Jushu Shrine within Kiyomizudera Temple in Kyoto. I’ve written about it before in my blog here. I was well exhausted after I finished wandering around at Hachimangu. But there is just one temple left, and it’s a really important temple. I almost gave up and wanted to just take the train back to Shinjuku, gobble down food, and crash into my bed and nap. The last temple is Meigetsu Temple, which is 1 station away at Kita-Kamakura (North Kamakura). This is another special temple, also famous for Hydrangeas. Meigetsu means bright moon, and one of the most famous spots in this temple is it’s beautiful round window looking into the back garden. Up to the temple, there is a long stairway up where Hydrangeas bloom on either sides. They also have a small bamboo garden along the outer side of the Hydrangea stairs. What I absolutely love about this temple though, (sorry going a bit backwards here), when you first enter temple grounds, you go over a small stone bridge. On the bridge there’s a small stone statue of a bunny and a turtle looking over the edge. I was so satisfied at the end of the day. I had walked around 20km, and it really satisfied my (unhealthy?) obsession with Japanese temples. I got onto the express train from Kita-Kamakura to Shinjuku. The train took only about an hour. I dozed off on the train, kind of woke up near Yokohama, and dozed off again. By the time I woke up, the train door was closing and we were leaving Shibuya. Phew! I woke up just 1 stop before Shinjuku. I can never get tired of traveling in Japan. I just love the culture, and it has so much to offer! There's abundance in nature, historical sites, Temples, museums, large shopping districts etc. What's best is Japanese people really put thought into making their cities and towns look orderly and clean. It's just such a pleasant feeling to travel there. In the next blog post, I'll be sharing my 2nd full day in this Japan trip. We'll be going to Lake Kawakuchi. It's one of the Five Fuji lakes where you can see Mt. Fuji near the lake.